This free & easy-to-use tool applies two simple principles to paying off high-interest debt. Similar to graduating college, acquiring a hefty amount of student loans has become almost a rite of passage for many young Americans as education costs continue to soar. More and more college graduates are struggling as they try to figure out how to repay these loans. Since having a college degree has become more of necessity, it seems that this issue will continue to be a common plight for young professionals. The current economy in the United States is reliant upon consumer driven spending. Individuals with higher amounts of school loans are often trapped in a monthly cycle of spending a large percentage of their income to pay these prices down, with little money left over for necessities like housing and food. They are unable to cover their payments in addition to other bills, and this issue has had an effect on other areas of their lives including whether to get married or have children. As a result, paying off education related loans as quickly as possible has become more important than ever. The price for a college education has risen steadily as state funding has decreased. Due to tuition hikes and rising costs for housing, books, meals, and other essentials, the student loan debt in America has accumulated to a staggering $1.3 trillion. The average bachelor degree educated individual carries a loan debt of $37,172 upon graduation. As the need to have a degree continues, so will costs. The statistics for student loan debt are very grim. Over 70 percent of college students graduate with debt. Unfortunately, U.S. educational costs will only continue to rise. Here’s a closer look at these frightening debt statistics. What the previous numbers tell us, is the average amount of loans per student in each state. Even more harrowing, is the fact that there are many students with balances much higher upon graduation. 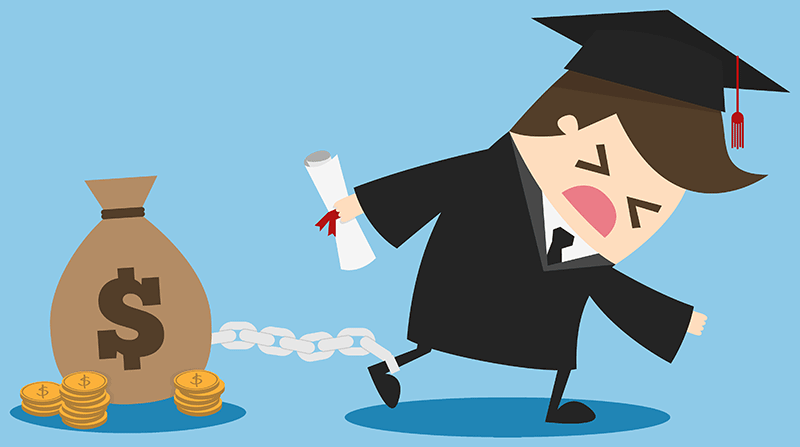 Most student’s, approximately 12.4 million, fall into the category of carrying a loan balance of $10,000 to $25,000. More than 42 million student borrowers have accrued a loan balance of up to an amount of $100,000. Over 2 million student loan debt holders carry balances over the price of $100,000. Of those 2 million, over 400,000 owe amounts greater than $200,000. The astronomical values owed by new graduates are not only hurting themselves but the American economy as well. Young professionals are struggling to pay these amounts and are unable to make big purchases like a home or a new vehicle. Many are left with no idea of how to chip away at these overwhelming balances. As educational costs continue to skyrocket there seems to be little hope that students will be able to stop acruing so much debt while in college. Being proactive in paying off student debt takes dedication. It's imperative to consider all options for repayment. After looking at the different options, making and sticking to a plan is paramount to gaining control of your financial situation. Since student loan debt is considered “good debt” according to many financial advisers since it helps to secure a better future, so as opposed to credit card debt or auto loans, you can choose a longer term repayment plan. Consolidating and refinancing the loans is an excellent way to tackle paying them off quicker. The main goal of refinancing your balances is to decrease the interest rates. This means that more of each payment goes towards paying down the principal loan amount, rather than the interest. By consolidating the loans, you can send just one monthly payment rather than several. If you fail to plan and choose a repayment plan, you will be placed into the standard ten-year plan. While this is fine for many people, your individual needs and ability to make payments may vary. By visiting StudentLoans.gov, you can look at the different plans available. You can also apply for an income driven repayment plan, which takes your income and ability to make monthly payments into account. By choosing this option, you can often lower the amount due monthly, into a far more manageable payment. However, this will increase the amount of time you will spend paying the money back. The Income Based Repayment plan, as mentioned above, is an easy and common way that borrowers can look into if they are experiencing financial hardship. Based on when you took the loans out originally, you can be enrolled in a plan that allows you to make payments for 20 or 25 years, at which point, the loans will be forgiven. In most cases, the loan payment will not go over 10 percent of your discretionary income.